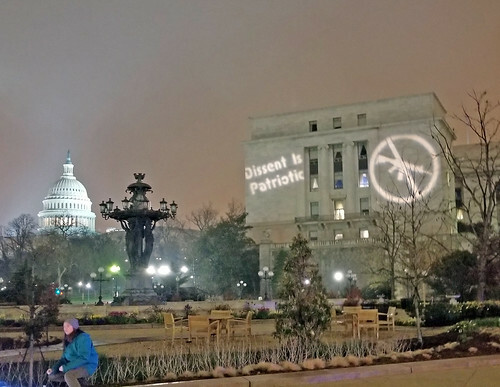 9 April 18: Backbone folks, plus newcomers looking to learn light projection, projected Healthcare messaging onto the Rayburn office building. 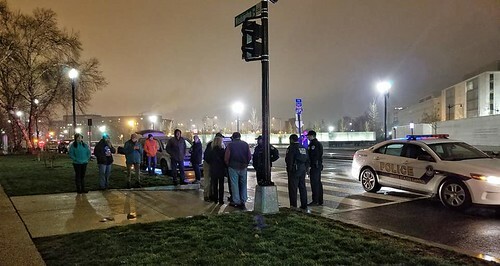 We had an exciting encounter with Capitol Hill police but were ultimately able to project what we wanted with no arrests! I likes to say that "Liberty is a muscle that must be exercised." The goal was to get healthcare related light projections up in a location where the Capitol was visible in the background of the photos. This severely limited location options. Phil, who does projections in DC often, warned the team that Capitol police are very responsive at the location we were projecting at. to shut down our projection action at the Rayburn office building - and succeeded for a while. After a lot of back and forth, and a decision to risk taking an arrest to defend 1st amendment protected speech, we were able to continue. The police decided they would give us three slow warnings before arrest. Within that limited time frame, the team was able to get the photos and leave with no arrests. The rain put a little bit of a damper on the action but the large team from the Healthcare Action Camp on scene kept spirits high during the long negotiation process, despite the late hour. Thank you to the great team of folks ready for anything. Was super proud to be part of such a great team, as well as all the crew from the Health Over Profit for Everyone - HOPE action camp. Special thanks to Kevin Zeese for his skilled late night, on-the-street legal support and negotiation skills. This action was done as pare of a Health Over Profit action camp. Visit the HOPE website to learn how we can bring Single Payer Healthcare to this country and to join us in that fight. Or visit the HOPE Facebook page and follow on Twitter. Check out more great Photos in the Healthcare Camp Flickr photo album! All photo credit to the amazing Jody Coss.